The struggle against the vicious-racist capitalist based Prison Industrial Complex and for the human rights of Raza prisoners, continues. 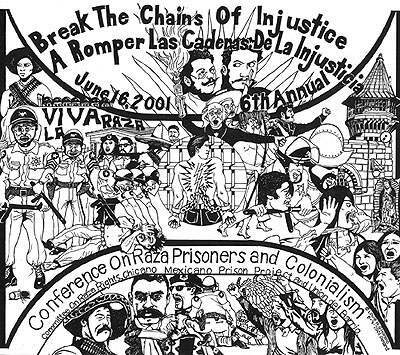 On June 16, 2001, the “6th Annual Conference On Raza Prisoners and Colonialism (CRPC)" will be held at Oxnard Community College, Oxnard, Califaztlan. This year's conference will be organized by the Committee On Raza Rights, Chicano Mexicano Prison Project, and Union del Barrio. Past conferences have been central in exposing the role that prisons play, in not only locking up Raza (Mexicanos, Centro Americanos, and other indigenous people) and other oppressed nationalities, but in keeping our whole community, through the threat of imprisonment, in a state of subjugation and colonial oppression. The conferences have become centers of information, networking, and resistance, for those progressive and revolutionary forces committed to ending all forms of oppression within our communities.